Kill on contact effectively with this amazing rackets! Watching the buzzing foes crackle, smolder and smoke fall before you is really exciting as well as a truly therapeutic exercise! Built-in battery operated, it is rechargeable so you don't have to keep buying expensive batteries. This is not a toy! Adult supervision is required. Do not touch the inner layer net with your finger or anything. Electric flyswatter built-in rechargeable battery and charger plug. Electric swatter racket for killing fly mosquito wasp gnats etc. Fly swatter zapper, instantly up to 2300 Volts, kill on contact! Handheld electric mosquito swatter racket can be used for indoor and outdoor, with large isolated swatter meshes, it's easy to kill the fly, mosquito, bugs, gnats, wasp, hornet insect with this special bug killer. 3 layers meshes of the electri mosquito killer is more safe. Please don't touch the middle layer mesh with anything when the electric mosquito killing bat turned on. 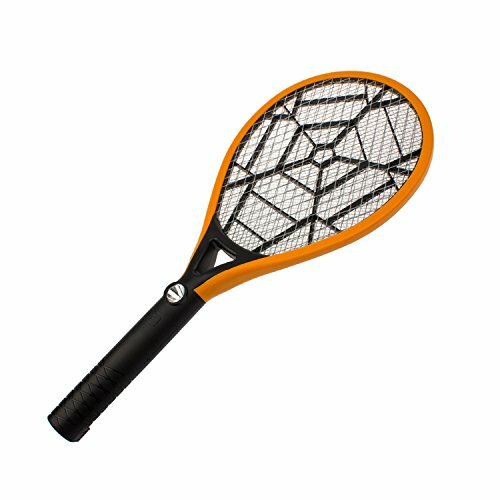 Racket fly zapper, like playing a tennis fly swatter racket, this powerful mosquito zapper racket has a built-in LED Zap light for attracting bugs, and use it like a night light at home or on camping in the dark. Eectric flyswatter you won't be bothered by the fly, bug, mosquito.providing you a nice and neat place for living and stay away from the pests that gonna spread to the food and even to us. No risk to buy! 100% Money Back or Replacement Guarantee!